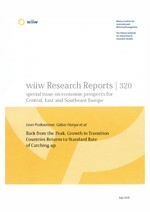 In its new special issue on the economies of Central, East and Southeast Europe, The Vienna Institute for International Economic Studies (wiiw) analyses the current economic situation in the region as well as development prospects for 2005 and 2006, presenting revised forecasts based on results for the first months of 2005. Brief surveys of the individual countries are added (covering Albania, Bosnia and Herzegovina, Bulgaria, Croatia, the Czech Republic, Hungary, Macedonia, Poland, the Slovak Republic, Slovenia, Serbia and Montenegro, Romania, Russia, Turkey, Ukraine, and China). A short analysis of the ongoing dispute related to the EU budget 2007-2013 as well as an annex with selected indicators of competitiveness and projections of per capita GDP until 2015 are attached. The high growth recorded in 2004 has been generally slowing down in the first months of 2005. The average GDP growth rate for the eight new EU member states (NMS) in the first quarter of 2005 dropped by 2.5 percentage points (to 3.3%), compounded by a marked deterioration of growth in Poland. The growth slowdown is associated with a slow expansion of gross fixed investment; massive declines in the rates of growth of industrial production; quite an abrupt deterioration in industrial labour productivity; and real currency appreciation and a resulting strong rise in unit labour costs. Despite this (and despite growth being weaker than expected in the euro zone), NMS foreign trade continues to perform excellently. Foreign trade has been even more instrumental in generating GDP growth in the first quarter of 2005 than in the past. It should be pointed out, however, that NMS trade with the 'old' EU has grown at a relatively slower pace. The first quarter results confirm our previous assessment of the medium-term prospects in the NMS. GDP growth will generally decelerate to below 4% on average in 2005; it will most probably not accelerate too much in 2006. Given the relatively poor economic performance in the euro zone, there is little that the otherwise constrained fiscal or monetary policies in the NMS can do to change this situation. Much more will depend on the corporate sector's willingness to invest. Growth in 2005 is also slowing down in Southeast Europe - particularly among the region's largest economies: Turkey, Romania, Croatia and Serbia. Fiscal consolidation and increasing trade deficits will thus hamper growth which over the biennium 2005-2006 will nonetheless range between 4 and 6%. Only in Croatia will growth be weaker. The prospects for further EU enlargements have taken a turn for the worse in the wake of the recent EU 'constitutional' and budget crises. That notwithstanding, the accession of Bulgaria and Romania is beyond dispute, possibly with a one-year delay. Despite high world market commodity prices, the robust growth in Russia may be a thing of the past. Already in 2004 investment growth was disappointing, reflecting high uncertainty and the deteriorating investment climate. Lagging reforms and huge structural imbalances blur the prospects for sustainable long-term growth. The stimulation of domestic demand through a fiscal relaxation will protract disinflation and induce real appreciation. This will be conducive to higher imports, a lower trade surplus and eventually to slower GDP growth. Following Ukraine's recent explosive growth, things are settling down somewhat, despite some fiscal relaxation. Currency appreciation has adversely affected the trade surplus, while the investment climate has been poisoned by rumours of re-nationalization and the lacklustre programme of the new government. China continues to register extremely rapid GDP growth, despite some slowdown in investment growth. Private consumption is picking up and net exports are rising faster than expected.